Some of you need to cease the denial and accept the harsh reality that the left hates you. It’s a fact, as much as the liberal gaslight gang and the conserva-sissy weakhearts deny it. You can tell that leftists hate you by the way that leftists tell you that they hate you. Take Sarah Jeong, please – hey, the New York Times was happy to get this bitter creep onboard because of her history of virulent racism. The Times saw her hate as a plus, not a negative, an asset, not a liability. You can’t draw any other conclusion – if you take her tweets, trade out the word “white” – man, does she ever hate white people – and toss in some other skin hue you’d have a pink-haired millennial David Duke. You may think you know the deal about her prejudice, but you don’t really know the deal, not until you read the full extent of the Ku Klux Korean immigrant’s portfolio of bigoted tweetery. It’s not merely ugly, stupid, and immoral – it’s downright sociopathic. Yet the flagship of the floundering fleet that is America’s liberal media saw the iceberg and went full speed ahead. We could go on about how if this was a conservative, he, she, or whatever the “groveling goblin” gender pronoun is, would be history, but we all know there is a double standard. What some of us have been unwilling to accept is why there is a double standard. Well, it’s because the people at the New York Times, and the liberal elite in general, agree with the hateful garbage Jeong and her pals dish out. Progressives think that it’s okay to hate someone solely because of the color of his skin. They aren’t against racism – they are actively in favor of racism. Sure, they dress up their shameful prejudices with the kind of convoluted nonsense their associate professors of oppression studies taught them as sophomores, but it all comes down to the fact that they hate white people. Of course, they also hate black, Asian, and Latin people too, when such patriots dare embrace conservative values. So, in that way, liberals are equal opportunity racists. They hate us. They want us dead – just ask Sarah, who wants to “cancel white people,” which sure sounds murdery coming from an ideological heir to Mao, Stalin, and Castro. And apparently, we’re even more terrible because we actually listen to what they say and then dare to draw obvious conclusions. To libs, that’s racist. We’re supposed to ignore what they say to our faces and instead imagine that these are nice people who wish only the best for us as they tell us to die. 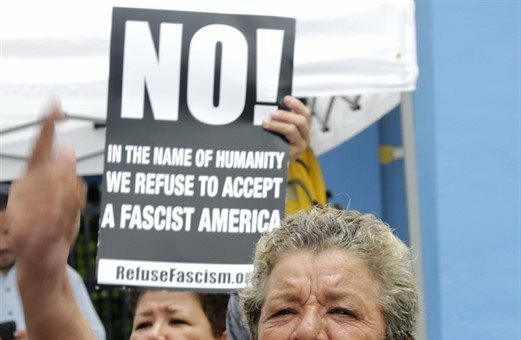 The left can’t hide its contempt anymore. Some of them, like that pink-mopped Harvard bigot, don’t even try. And, as my upcoming book Militant Normals: How Regular Americans Are Rebelling Against the Elite to Reclaim Our Democracy points out, in brutal and hilarious detail, Normal people – that is, those of us of all shades of skin hue who refuse to buy into the liberal elite’s sickening racist dogma – tend to take elitists telling them they hate them pretty seriously. Not the Fredocons though. Those saps. This is a golden opportunity to steal the ball and run up the score, but as usual, these useless goofs seem intent on fumbling. Count on them to fuss and whimper their way into submission when they should be taking the fight to the left. We’re supposed to not “join the mob” and generally give the left a free pass on this latest atrocity, just like we’re supposed to give them a free pass on every other atrocity we’ve endured. Well, hard pass on the free passes. Leftists don’t get to pull this garbage and just get away with it. Regardless of the principles of True Conservatism™, it’s perfectly okay under actual conservative principles to protest the liberal elite’s public embrace of outright race-based hatred. And this imbroglio is a perfect weapon for us, because it perfectly encapsulates our enemy’s hateful view of us in a way every midterm voter between the coasts is going to understand. We need to wield it like a sledgehammer in anticipation of the upcoming election. You soft boys can pivot back to your “We’re better than that” pose and go AWOL, again, like you always do. But I say the Sarah Jeong/NYT love affair is a suppository, and I say we start curing the hemorrhoid that is liberalism by giving the left a double dose good and hard right up the progressive tract. We need to accept the harsh reality that a substantial number of our fellow citizens hate our guts. All the simpering blabber about civility, all the clichés about unity, are all just comforting lies. A bunch of them hate us. And we need to stop pretending the truth right in front of us is not right in front of us. This is not going to be a single skirmish. This is a campaign, a long and difficult one with the objective of destroying the ideological cancer metastasizing through America’s body politic. Step One: We must ruthlessly attack any manifestation of their hate using all the political and cultural tools at our disposal. We need to make liberal racism painful, so they are incentivized to abandon it. We’re not here to win moral victories. We’re here to win victory victories. My novels People’s Republic and Indian Country show what will happen if we lose. Spoiler: It involves camps, but not singin’ around the fire and roastin’ marshmallows camps. Step Two: We must win elections. And yeah, you cruise-shilling Never Trump sissies, that means being all unseemly and gauche by going to the electorate and pointing out liberals’ disgusting acts of contempt against them, like the elevation of this Jeong twerp, and telling the American people the truth – that the elite hates them and that they must get militant and retaliate at the ballot box. Let’s make liberal elite’s racism against the majority of America an election issue. The Democrats are the party of hating white people (and non-white people who refuse to toe the liberal line). Let’s say so, because it is so. Yeah, I know it’ll give the bow-tie boyz the vapors, but it ain’t demagoguery if it’s true. Step Three: Get your head right and keep your powder dry. We all want America to return to E Pluribus Unum and a consensus in favor of individual freedom, but we need to grow the hell up and accept that this might not happen without a struggle. Our enemies don’t want it to. You have seen the left adopt explicit racism as a core value. You have seen the attacks on our right to speak freely. You have seen the attacks on our right to worship freely. You have seen the attacks on our right to keep and bear arms. Do you imagine that once we give up our right to speak, to worship, and to protect ourselves and our liberty, that the racist Sarah Jeongs of the world, should they take power, will somehow suddenly stop hating us and be cool? Chet the Unicorn might think so, but do you? Know that he, she, or xe means you harm. Be ready to defend your life and your freedom by exercising your right to do so. Luckily, it probably won’t come to that since the prog hipster militia can’t find skinny battle rigs or vinyl plates, and their chests would be too concave to lift AR-15s if they actually owned any. You, however, should own several just in case the left tries to act on the hate they’ve demonstrated. Accept the awful truth that leftists hate you and act accordingly. All you have to do is listen to the likes of Sarah Jeong and her pals at the New York Times – they will be happy to tell you what they really think.